Don’t let the farm implements and the log-cabin vibe fool you, this Gowanus bar is up to the most stringent city standards. 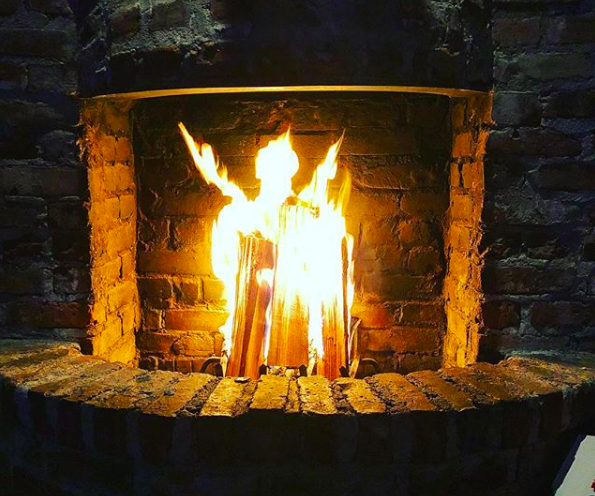 They’ve got a fireplace to warm you up this winter, along with Adirondack chairs that may be hard to leave after a couple drinks. Black Mountain Wine House has, as one might expect, an extensive wine list, but their selection of bottled beers isn’t to be scoffed at. Paired with a selection of small plates, this is an ideal date spot for those making a late start on cuffing season. Cherry Tree’s fireplace is often lit on these cold nights, and its location makes it a good choice if you’re seeing something at Barclays, or you’re trying to round up friends from all over, with so many subway lines stopping at Atlantic Ave. Plus, happy hour runs until 8 pm, and if you’re hungry, they can bring pizza over to you from next door. This is a beer-lovers’ paradise, with an always intriguing list of brews that changes up regularly, and occasional events where you can talk hops with the brewers themselves. And on a frigid day, you can grab that cold beer and take it to the fireplace in the back — but it’s definitely a coveted spot, so get there early. A bonus for The Owl Farm is its proximity to the 4th/9th subway stop, so you don’t have to walk too far in the wind (though waiting on that F/G platform might drive you back inside for another fireside pint). We talk so much about the exciting events that go on in the Union Hall basement that we almost forget how cool of a bar it is on its own. And it is a pretty cool bar! The two lanes of bocce, the extensive library that fills up the built-in bookshelves, the old-time-y portraits, the leather armchairs — it all makes for a stately but cozy atmosphere which is completed by its stone fireplace. The place gets pretty packed on the weekends, though, so get there early to stake out a good, warm spot. A bit further afield than the others, this pub in Boreum Hill leans heavily into the little cabin in the city vibe. The requisite fireplace, of course, but a Big Buck Hunter arcade game to satisfy the urban woodsmen among us. While the boardgames have gone extinct—too many missing pieces—there’s still great happy hour deals to be had. And, most importantly, S’mores with your own little fire to roast them over. How’s that for cozy? Know any other spots that we missed? Share your favorites in the comments below! Half these bars aren’t even Park Slope. Agreed, but keyword “near” in the title of the article.